The following account is taken from an article by Alan F. Cook entitled: 'Humphrey Adderley of Weddington' and first published in 'The Nuneaton & North Warwickshire Family History Society - Journal. January 2002.' A fuller account of the whole history of the Adderley family ownership and development of the Castle estate be found on the excellent website 'Landed Families of Britain and Ireland'. Humphrey Adderley was born 1512 and died 1598; a courtier, born in Blackhaugh (Blake Hall), the family home, near Cheadle, Staffordshire, the fourth of seven children of Thomas Adderley (c.1480-1538) gentleman and landowner, and his wife Joan, daughter of John Thirkill (Thirkeld) of Smallwood, Cheshire and his wife Elizabeth. The Adderley family was of considerable importance and antiquity in Staffordshire; it is through this connection that he probably became a Groom of the Wardrobe of the Robes and later a Yeoman of the Wardrobe of the Robes from c.1530 to c.1570. The Royal Court had no permanent base and periodically moved on the following circuit: Whitehall, Nonsuch, Woodstock, St. James’s, Somerset Place, Oat lands, Richmond, Greenwich, Hampton Court and Windsor. This was a journey of some 220 miles (excluding various Progresses) and involved continual dedicated and meticulous planning for which only a few people were intellectually suited. His service through the reigns of four monarchs (Henry VIII, Edward VI, Queen Mary and Elizabeth I) illustrates his exceptional personal qualities which engendered long lasting trust and discretion. Queen Elizabeth on 4th April 1562 gave the following to Henry, the Earl of Huntingdon, John Cholmeley and Humphrey Adderley: Weddington manor, Warwickshire, value £30 19s 4d (previously owned by Henry, Duke of Suffolk) and the advowson of the Rectory at Weddington. This was supplemented with Packington Heath manor, Leicestershire, value £20 6s 4d and its capital messuage, lately in tenure to Robert Leason. These were held by service of the twentieth part of a knight’s fee. A yearly sum of 10s from Weddington was paid to Jasper Leke. By 1566 Adderley had become the sole owner of Weddington and its rectory and no longer held any rights at Packington. Adderley had Weddington Hall built - or rebuilt - in brick and local Attleborough Sandstone c.1566; it was situated on a low ridge overlooking the River Anker floodplain and had uninterrupted views of the geologically unique and beautiful Oldbury-Hartshill ridge until the Hall’s demolition in 1928. This topographic ridge featured numerous halls and granges, notably Dugdale’s Merevale Hall; the views from the ridge were immortalised in Drayton’s ‘Polyolbion’. Adderley’s lands were farmed by a mixture of arable and pastoral agricultural methods. In 1564 his wealth included a parcel of land at nearby Higham-on-the-Hill, Leicestershire, leased to him by Queen Elizabeth for 21 years at 70s rent. The Queen also gave him “one Gowne of blak vellat with Satten grounde with a brode garde of vellat with foure styches of Silke edged and ravelid, and edged with Sables and lyned with sarceonet and fustian”. In 1571, Adderley married Anne North of Northampton, he acquired Melton Mowbray rectory in 1572 demised to him at a rent of £16 1s 3d; he did not retain this until his death because Castle Donington rectory living and tithes along with Wartoppe Grange and Watertofte Grange appeared to be his only non-local possessions. This marriage union produced a daughter, Anne, baptised 20th May 1578 who married William Wightman of Wykin, Leicestershire (an extant business family). In that same year Adderley had two parcels of land at Groby, Leicestershire, demised by him for 21 years at £5 5s 8d; he did not retain these at his death. His Will indicated the following legatees: Sir John Harington, a confidante of Elizabeth; Richard Chamberlain, lord of the manor of nearby Astley; James Cranford, son of the master of Coventry Free School and Dugdale’s tutor and Charles Hales owner of estates in Bedworth and Coventry. It is possible that his first wife died during or shortly after the birth of Anne. On 7 May 1581 he married Elizabeth (Elsebeth), daughter of Richard Capel (Rycherd Capell) of Rudgwick, Sussex. 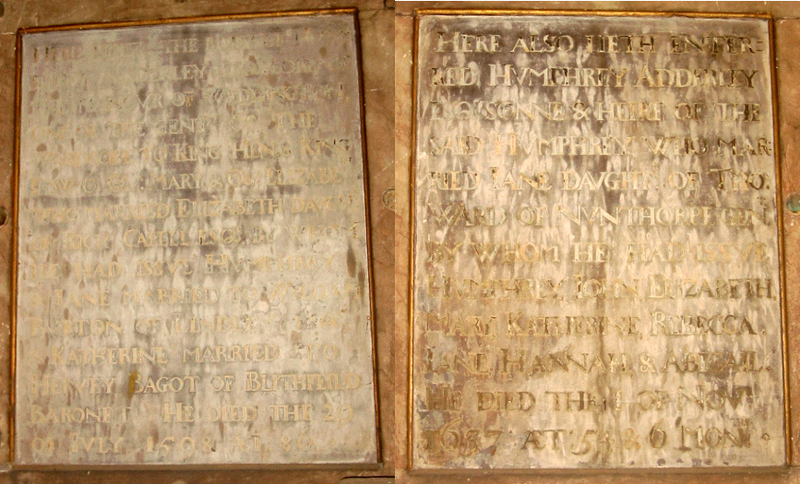 They had three children: Humphrey, born 1583, who married Jane, daughter of Thomas Ward of Nunthorpe, Yorkshire. 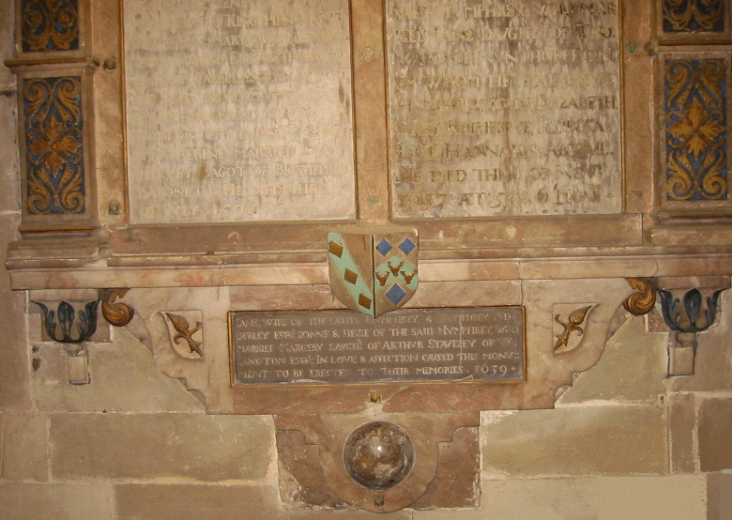 He had seven children - Humphrey, who married Jane, daughter of Sir Wolstan Dixie of nearby Market Bosworth and who was buried 1 April 1637. Also, Jane, Rebecca, Elizabeth, Maria, Katherine and Jane. Jane, born 2 February 1589, married the local antiquarian William Burton of Lindley. The youngest child was Katherine, born 10 January 1594 who married Harvey Bagot of Blithefield, Staffordshire. 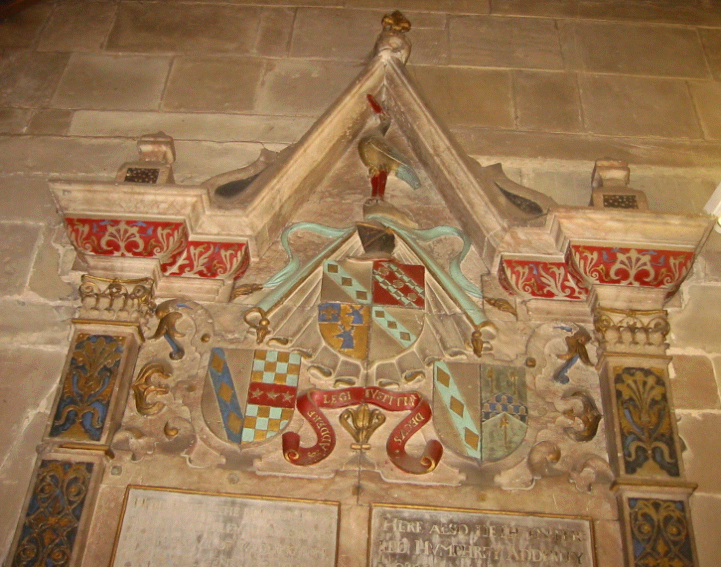 His descendants are Baron Norton of Norton-in-the-Moors, Staffordshire. In the 17th, 18th and 19th centuries there were a number of prominent families in the English Midlands of the surname Adderley, who ultimately all trace their descent from Thomas Adderley (d. 1538) who settled at Blake Hall in Moreland (Staffs) in the early 16th century. He had five sons and three daughters, of whom the first, third and fourth sons founded lasting landed dynasties, as shown in the diagram below*. Pictures marked '**' are from the collection of Alan F Cook for which grateful acknowledgement is given.